In India, while Congress’ pink-lipped Rahul Gandhi is visiting poor people’s homes, future King William is sleeping on the streets to intensely sense the problems of the homeless. Yes, making a bed from ragged cardboard boxes in a quiet lane near the River Thames, Prince William has just slept rough on London’s streets on an extremely cold night, with temperatures down to minus four. 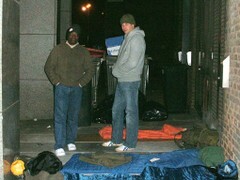 From about midnight last Wednesday, the prince slept out in the open until 6 a.m. He then also cooked breakfast for a group of homeless people. In doing so, William, 27, appeared any of the thousands of homeless shivering on London’s streets on a bitterly cold night. The gesture was part of his support for a UK homeless charity Centrepoint and to raise awareness about those sleeping rough. He was joined by Centrepoint’s chief executive Seyi Obakin, who told GREATER VOICE that William’s mother, Princess Diana, had earlier taken him on a secret visit to a Centrepoint shelter as a child. This had left a lasting impression that led him to become the organization’s patron. “At a dinner some time back, I invited him to share, for one night, the experience a young person sleeping rough on the streets of London might have. It did not occur to me that he would pick up that gauntlet. But he did!” Obakin said. Obakin said one of their hairiest moments on the night occurred when they were almost run over by a road sweeper which simply didn’t see their small group huddled together, which just goes to show how vulnerable rough sleepers are. At dawn, Prince William walked through some of the streets of the West End so he could see with his own eyes many of the invisible men and women who are rough sleepers in the buzzing centre of London. Prince William must have understood that what he experienced would just be a fraction of what it means to be truly homeless and afflicted. Next HOPING AGAINST HOPE ! To visit the homeless via Centrepoint, Prince William allowed his cherished sensitivity to spring forth that was always appreciated and apparent in his mother, Princess Diana who continues to live in spirit. Proper philosophy and reasoning is so necessary in all of our lives around the world. 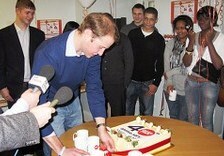 I am so proud to see that Prince William is trying to understand the problems that plague his future subjects. The only true way to do so, is to do as William is, and that is going out and having the experience himself. Discussing the cold and hunger while sitting by a cozy fire sipping a hot drink is one thing, but to really grasp it, you have to experience it. While Diana may have been “The People’s Princess”, and deservedly so, I believe you, Prince William, will become the “King of Hearts”. God bless you, your work, and lend you strength to do what is right. Propriety be damned. I tip my hat to him. Nice job.